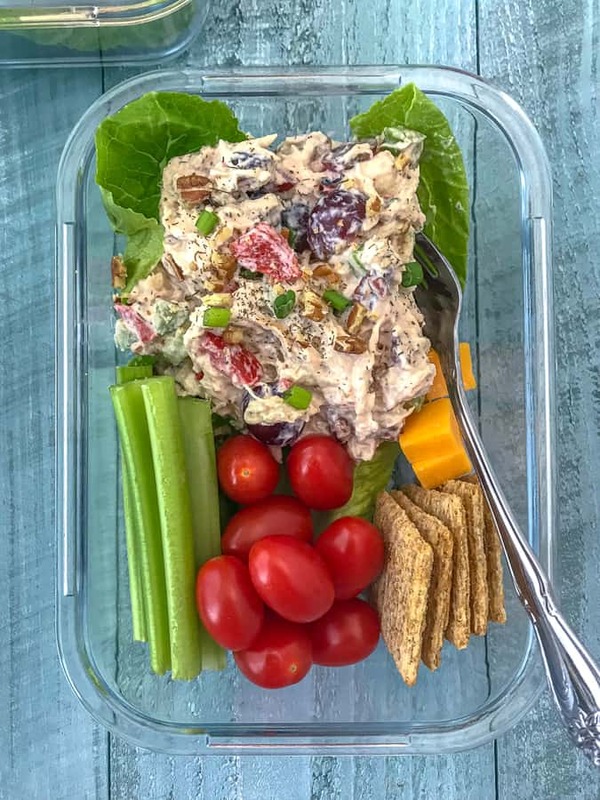 This Healthy Garden Chicken is the perfect meal prep option if you’re short on time and looking for something that is not only delicious, but filling! 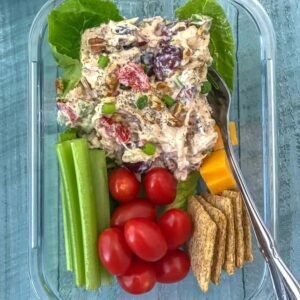 This recipe is a lightened up version of the traditional chicken salad and is packed with vegetables and grapes. Guaranteed to become a favorite to your meal prepping routine. Great on top of a bed of greens, in a sandwich, or served with crackers. We absolutely love salads in this household. Not only because they are healthy, but when made right, they can be absolutely delicious. It’s like a smorgasbord of flavor with each bite! Anyone else feel this way about a good, hearty salad? Some of our favorites have been Cucumber Avocado Corn Salad, Cajun Lime Chicken Avocado Corn Salad, and my Cilantro Lime Shrimp and Avocado Salad (super popular with my followers!). Don’t get me wrong. I will make or order ribs without question. 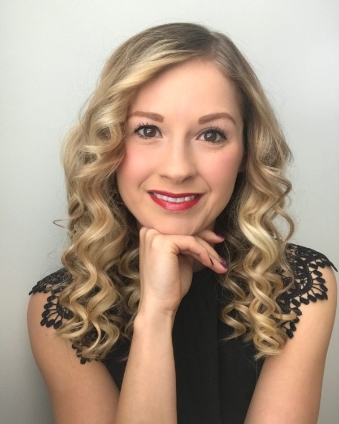 I’m not the kind of girl that sticks to salads because she’s “watching her figure.” I mean, I am always watching my figure, but life is too short to not allow a few indulgences here and there. I eat salads because I actually enjoy them. So you will always find a big bowl of prepared greens with vegetables ready to make a salad in this house. Whether it’s for a meal or as a side dish, it’s an option! 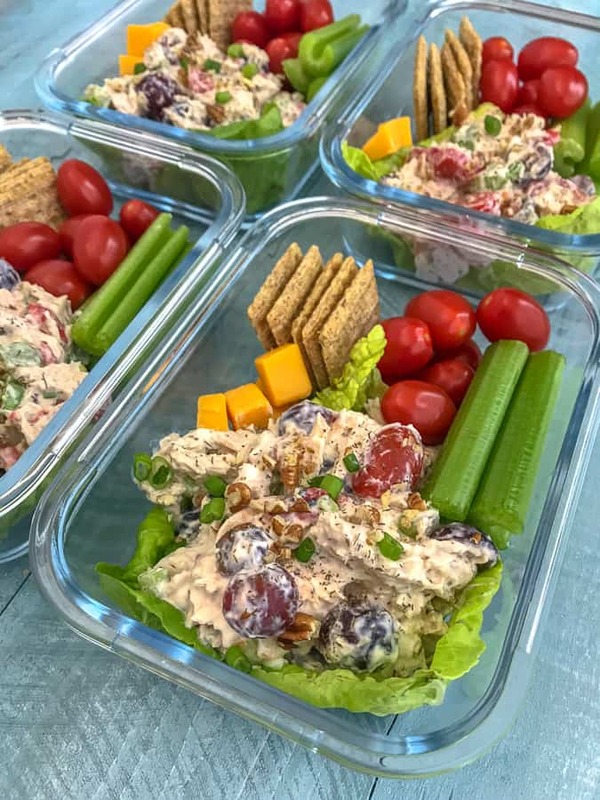 The Healthy Garden Chicken Salad for this meal prep comes together so quickly and easily – without any cooking required! If you have pre-cooked chicken or rotisserie chicken on hand you will have this salad made in 15 minutes. Toss in the remaining side items and you have your meal prep ready to go! 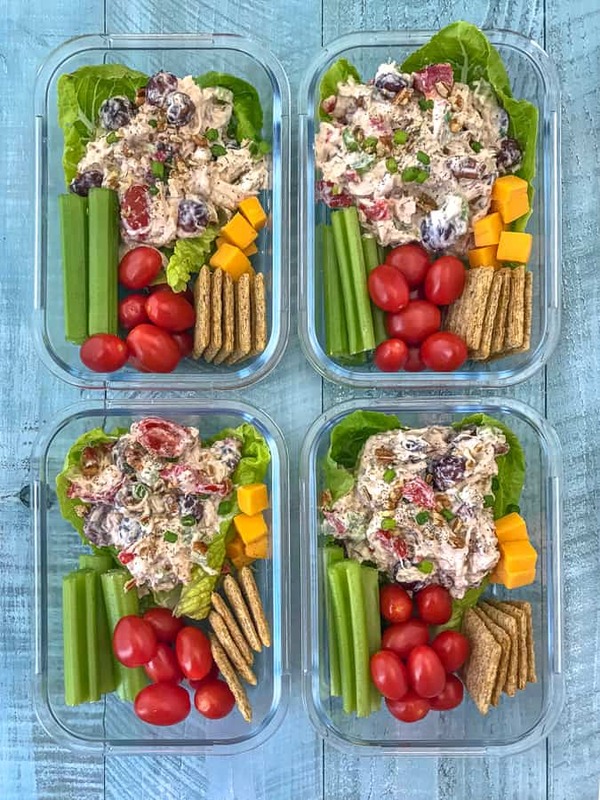 HOW LONG DOES THIS SALAD/MEAL PREP LAST? 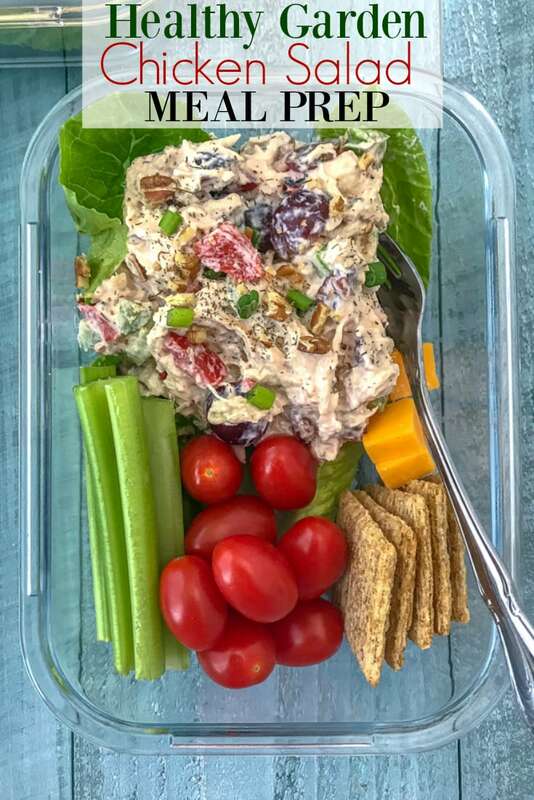 Chicken salad will last refrigerated for 3-4 days. Make sure that it is stored in an airtight container. Keep in mind that water will release from the salad and the lettuce as it sits. Simply drain any excess water and give the salad a good stir, if needed. For food safety reasons, do not keep this salad out of the fridge at room temperature for more than 1 1/2 to 2 hours. CAN THIS CHICKEN SALAD BE FROZEN? For flavor and textures sake, I do not recommend freezing this salad. I have never had a good experience with mayonnaise being frozen and then thawed. It will separate when frozen and crunchy items, like celery, do not freeze well. An easy, quick and flavorful meal prep salad that comes together without any cooking required! Full of vegetables, pecans, greek yogurt, grapes, and so much flavor. Sure to be a new favorite to your meal prep routine. 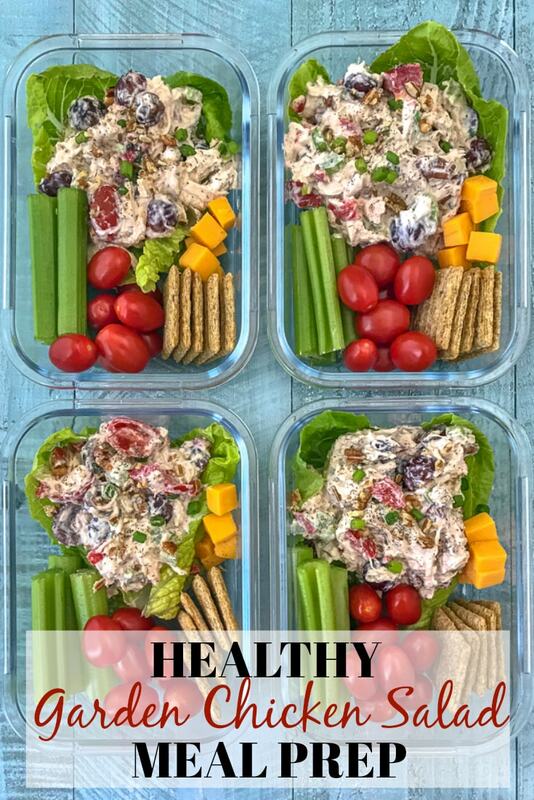 To 4 meal prep containers, layer two romaine leaves to each dish and scoop 1 serving of the chicken salad to rest on top. Add in the sides: cheese cubes, celery, tomatoes, and crackers.